How to Wear Palazzo Pants for Plus Size Women. Plus size women are usually not comfortable wearing stylish clothing as most of the feel insecure whether the dress or the style will suit them or not. Thus most women end up wearing the same style of dress and they don’t experiment with different cuts and variations. 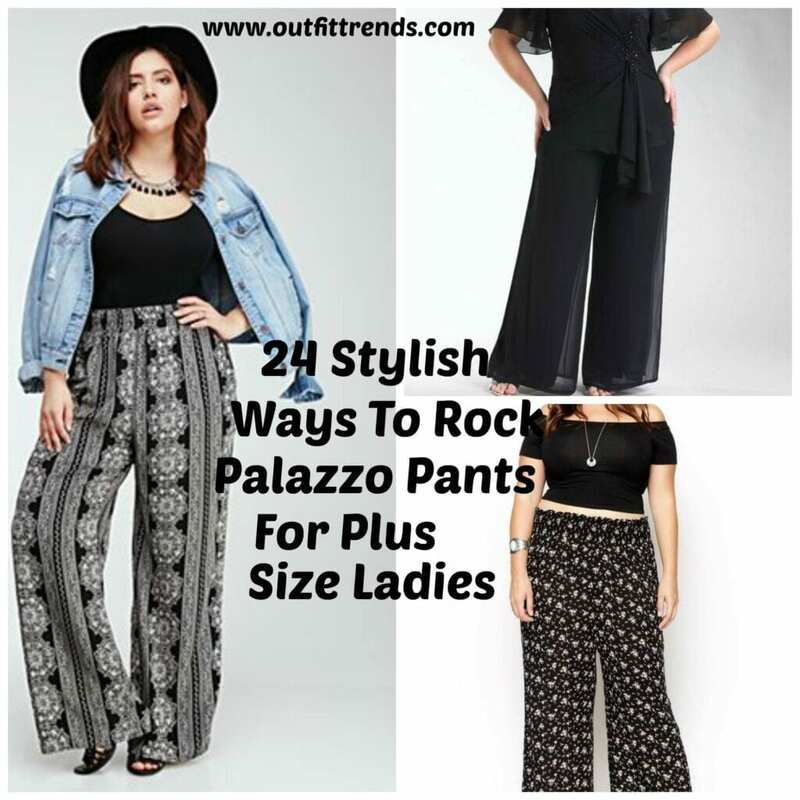 Well, we have pulled together the best styles for plus size women who can wear palazzo pants for different occasions and events. A good and always the best technique to follow is that if you are a plus size woman you can wear palazzo pants but make sure they are mostly in dark shades, like in blacks or browns. The dark shades always make the body appear slimmer and in shape. Black palazzo pants are the ultimate fashion solution, not only can you wear them with multiple top styles like a simple crop top, or a button down shirt but you can also wear them with different footwear. Your footwear can include pumps, block heels or even sandals. Who doesn’t own a denim jacket? These are the easiest and ultimate fashion accessory that are found in every girl’s closet. Well, you can easy pull off a denim jacket over a palazzo pant. To make the look more rocking, you can wear a statement necklace and a cowboy hat to look more ravishing. A fun way to go about your palazzo pants and to make it versatile is to have a palazzo pant which is multi-colored. The best thing about having a multi-colored palazzo pants is that it can be combined with as many colored tops as possible. And you will be rocking a new look every time. If you are really unsure about how to style your dress, then worry not! You can always wear the same tone dress and it will always look good. You can opt for a bold lip color and little bold eyes and that is the easiest way to look stylish in even a single tone palazzo pants outfit. Many women remain confused regarding the hairstyle which will match the whole look, especially in the case of palazzo pants. The best hairstyle is definitely loose curls. These give a very soft and natural touch to the whole look. You can always make your whole look more feminine or something which is suitable for part wear. Similarly, for palazzo pants, you can top it with a floral print top which has different cuts. This will look great for hi-teas or a semi-formal friends hang out. Off shoulder tops are pretty much in these days, they make women look chic and classy. You can wear plain or printed off shoulder tops, with black or any other plain palazzo pants to look effortlessly stylish. Women and young girls who love to dress differently can wear funky and bright colored palazzo pants with plain tops. To even add on more they can wear a chunky pendant and make the overall dressing more fun and more outgoing. When you run errands you want to be as comfortable as possible, with respect to the dressing, but look appropriate and well dressed at the same time. In such cases, the easiest thing to do is wear your favorite printed palazzo pants with a bright colored top. This look is super comfortable and pleasing to carry. Want to achieve the classy summer look? Opt to wear a printed palazzo pant with a tank top, to add the charm wear a statement necklace and a scarf loosely around your neck and you have the perfect summertime look. Sundays are fun days, which means that the dressing should be also casual and fun. You can wear the tank top with palazzo pants and add on a leather bad when you are hitting the streets or going for a lunch. Who doesn’t love all time classic black and white attire? Well, you can pull on this look with your palazzo pants in multiple ways and still manage to look as ravishing as ever. There are times when you are the host of the party, where you have to look presentable but also stay active so you can manage your hosting well. In these times choose gray palazzo pants with a fancy top, add on a pendant and you are good to go! Being a tourist means to be able to cover a lot many places, and it also involves a lot of physical activity so wear comfortable yet cute dresses, like a printed palazzo pants with a frill top. So you have got both comfort and style as you travel. Planning to spend a day with your best friend? Here is a great idea, wear your favorite tank tops with the identical floral palazzo pants to look stylish and cute and have lots of laughing sessions.